As rising tuition costs pile mounting debt on students, lenders and colleges are asking for additional alternatives: Load more debt on their parents. 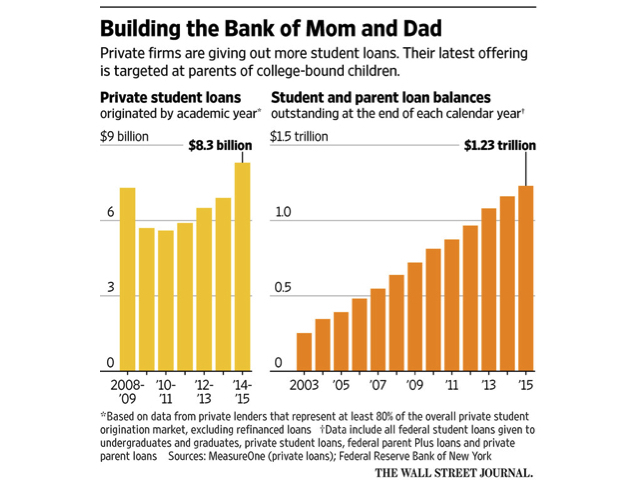 A rising number of private student loan lenders are introducing parent loans, which allow borrowers to fund their kid’s education without putting their student on the hook. The loans mirrors a similar federal program (Parent Plus Loans) but don’t charge the hefty upfront fee levied by the government (4.3%), which could make them cheaper and encourage more use. Parents will be able to borrow at interest rates ranging from about 3.75% to 10%, with 5 or 10 years to pay it off, depending on the lender. The average student debt for graduates with a bachelor’s degree is projected to be $37,000 for 2016, up 78% from a decade ago, according to a recent WSJ article. This is mostly due to the fact that the average annual cost of a four-year, private college, including room and board, has climbed 53% in the past 10 years, to $43,921, according to the College Board. For public schools, it is up 61%, to $19,548 for in-state students.